Silent But Deadly® is an outrageous award winning card game of windy fun! Quick to learn, easy to play, and loads of gassy guffaws. 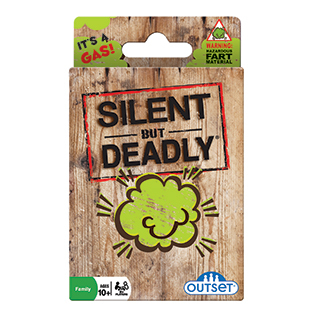 Loosely based on the traditional card game of Crazy Eights, Silent But Deadly® includes humorous fart facts that add an element of twisted fun. Where else could you learn about 'Floating Biscuits', 'Fluffy Poots', 'Eggy Stinkers' and more fartastic farts!? A kids card game that adults will love playing toot! Item # 13290 Weight 0.24 lbs.